During a press conference with President Trump, the President had a heated exchange with CNN’s Jim Acosta telling him that they should be ashamed of having employed him. At one point a White House aide tried to get the microphone from Acosta, but he grabbed it right back from her while slightly pushing her aside. Trump went on to say that he didn’t think he demonized immigrants by his portrayal of the caravan. When pressed by Acosta on a controversial campaign ad about immigration, which several networks, including Fox News, pulled for being too incendiary, Trump argued the ad was accurate. “Honestly, I think you should let me run the country. You run CNN and if you did it well, your ratings would be much better,” Trump said. 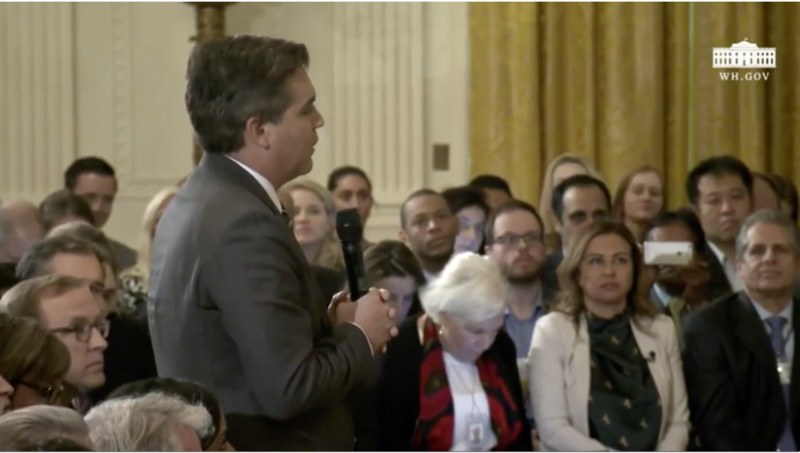 No Comments on "Trump To Acosta: CNN Should Be ‘Ashamed’ Of Employing You"